In Rwanda, Jhpiego is promoting community interventions that reach women at the village level with appropriate information about malaria in pregnancy (MIP)—enabling women to become informed actors, not only beneficiaries. With the application of a community-to-clinic continuum of care approach through the ACCESS Program, Jhpiego is implementing activities to prevent and treat MIP in Rwanda. Jhpiego’s community approach is rooted in the use of female volunteer community health workers (CHWs). These CHWs, who are selected by village members based on literacy, willingness to volunteer and acceptability by other women, reach women and their families with important MIP messages. CHWs routinely encourage women in the community to access vital antenatal care services at clinical facilities where malaria treatment and prevention services are also available. Presently, there are 60,000 CHWs in Rwanda—an impressive number that the Rwandan Ministry of Health is supporting and coordinating through its Community Health Desk. Each village selects two CHWs, who are mandated to record all women in their community in a register and monitor their health. Given that an average Rwandan village has 150 households, each pair of CHWs may monitor between 75–90 pregnant women annually. CHWs follow each woman to make sure they attend antenatal care; use malaria preventive measures such as insecticide-treated bed nets; make a plan for delivery and potential birth complications; deliver with a skilled provider; and receive information on nutrition, family planning, malaria, HIV/AIDS and danger signs during pregnancy and delivery. 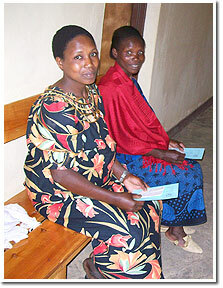 The CHWs are trained by their supervisors at the nearest health center in the local language, Kinyarwanda. They are monitored through regular meetings with their supervisors and when they accompany pregnant women to health centers. Further, a monitoring system to track CHW activities is being developed. In collaboration with ACCESS Program partners, the Ministry of Health and other local partners, Jhpiego has adapted behavior change messages for the community and updated CHW training materials and tools. Using these updated materials, Jhpiego is assisting the Ministry of Health to provide in-service training activities to 300 CHWs this year in its 14 ACCESS-assisted districts, which cover a population of approximately 4.8 million. By incorporating CHWs into our community-to-clinic continuum of care, we can begin to count malaria out in Rwanda at the village level and beyond.